A summary of the 12-hour verdict by 5 Constitutional Court judges. President Museveni emerged top winner while MPs and Local Councils were the biggest losers in the age limit petition following the Constitutional Court's majority ruling that upheld the removal of the 75-age ceiling for president but quashed the extension of the term of the current Parliament. The judgement was delivered at the High Court in Mbale District where the hearing was held yesterday. 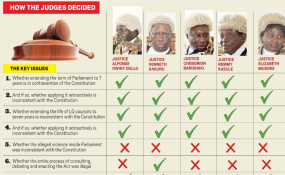 The five justices on a 4:1 majority verdict ruled that the MPs followed the law in amending Article 102(b) of the Constitution that removed the age limit on the presidency and allowed Mr Museveni to stand for re-election in 2012 and as many times as he wishes thereafter. Accordingly, sections 2, 5, 6, 8, 9 and 10 of the Constitution Amendment Act are struck out. All the five justices unanimously nullified the extension of the term of Parliament and Local Councils 3 and 5 from five years to seven. The dissent was only on whether the whole Act is a nullity. On this issue, the Deputy Chief Justice Owiny-Dollo and justices Remmy Kasule, Elizabeth Musoke and Cheborion Barishaki upheld the Act while Justice Kakuru dissented and declared the whole amendment process null and void. However, the five justices of the court unanimously declared that sections 1,3, 4, and 7 of the Constitution Amendment Act No. 1 of 2018, which removed the age limit for the President and chairpersons of Local Councils 3 and 5, were passed in compliance with the Constitution. "They therefore remain the lawful and valid provisions of the Constitution Amendment Act No. 1 of 2018," ruled Justice Owiny-Dollo, who led the panel of five justices of the court. However, the same court in a majority decision, said the extension of the MPs' term of office was done without the participation of the electorate, a move the judges said was against principles of good governance. "By a unanimous decision, court declares sections 2,5,6 8, 9 and 10 of the Constitution Amendment Act of 2018, which provide for the extension of the tenure of Parliament and local government councils by two years and for the reinstatement of the presidential term limits, unconstitutional for contravening the provisions of the Constitution," Justice Owiny-Dollo further stated. On the extension of the tenure of Parliament, all the five justices unanimously agreed that the MPs were elected by the people under a social contract for only five years and cannot vary their stay in office without consulting the electorate. The petitioners had asked court to determine whether sections 2 and 8 of the Act extending or enlarging the term of Parliament from five to seven years was unconstitutional. The court also nullified the restoration of presidential term limits saying they were passed by Parliament unconstitutionally. The two five-year presidential term limits were removed by Parliament in another Constitution amendment in 2005. Since the petitioners partially won the case, the court awarded them professional fees of Shs20m each but Mr Male Mabirizi, who represented himself during the hearing was not awarded any professional costs because he is not an enrolled advocate. However, Justice Owiny-Dollo said Mabirizi would benefit from two-thirds of the non-professional costs awarded to all the petitioners as general expenses they incurred in preparation and execution of the petition. The Deputy Attorney General Mwesigwa Rukutana, who led the government's legal team, in his parting remarks, told court the rule of law has been maintained even in those areas that they may be dissatisfied. Mr Dan Wandera Ogalo, the lead counsel for the petitioners and lawyer for Uganda Law Society, told court that he fully agreed with the submissions of the Deputy Attorney General on the judgement. He said even when there were areas where they did not agree with the judgement, they would abide by the decision of the court. He added that they were taught in law school to respect all court decisions even if they did not agree with them in a bid to give confidence to the Judiciary. Mr Ogalo thanked the justices for the patience they exhibited during the whole hearing process of the petition.